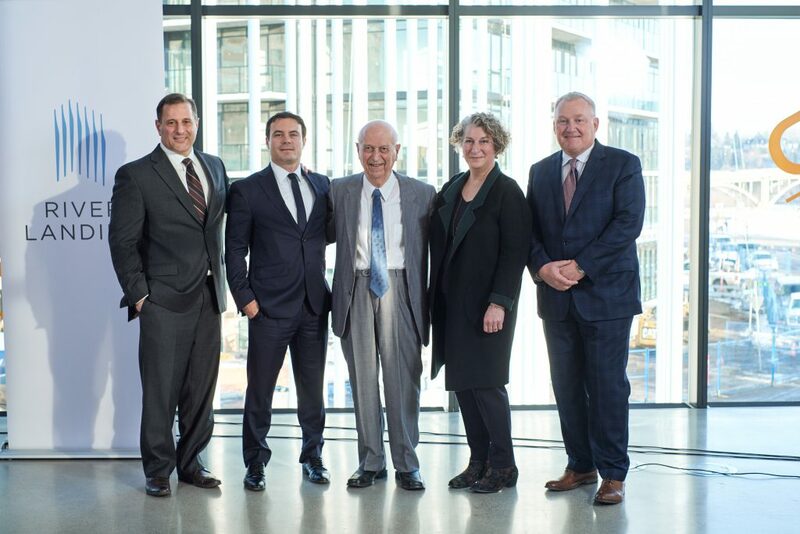 Triovest recently celebrated the start of construction for Nutrien Tower, the final phase of River Landing. Construction of Nutrien Tower commenced just 24 months after the first phase, much earlier than anticipated. 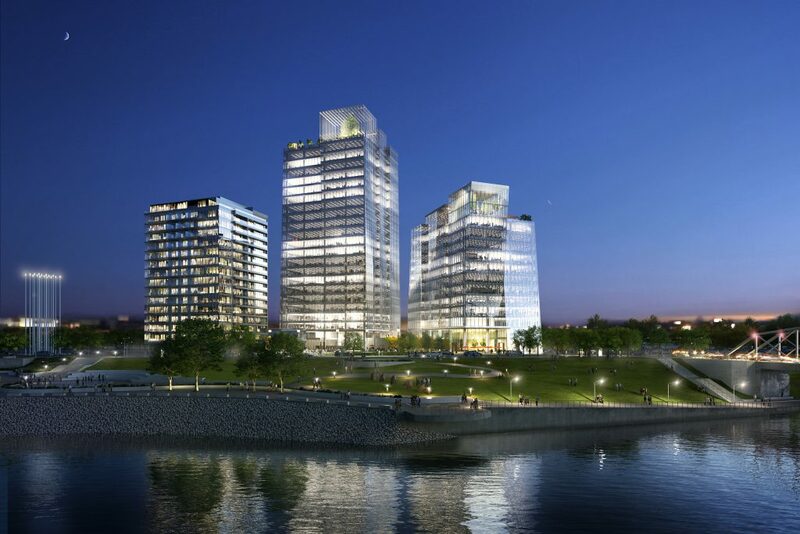 Included as part of the final phase of the project is a world-class riverfront public plaza. 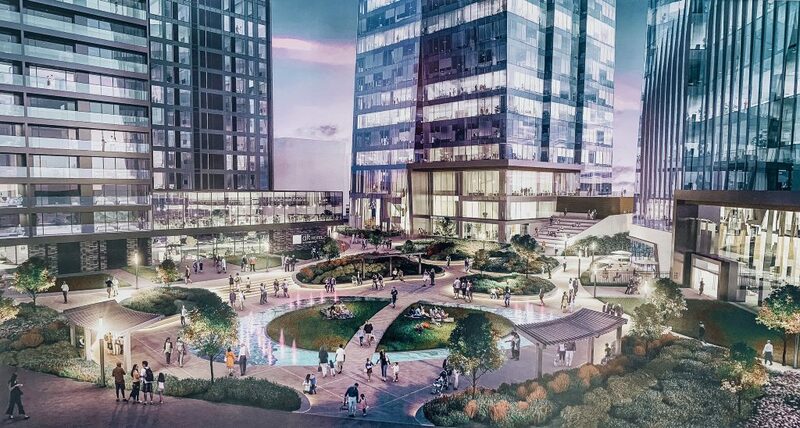 This plaza will be the focal point of the development and at this time will be the only office development in the City of Saskatoon that includes an outdoor plaza as part of its outdoor realm. Triovest, on behalf of TD Greystone Asset Management Inc., was honoured to announce that the plaza will be known as K.W. Nasser Plaza. Mr. Nasser’s love of Saskatoon is well documented, and he has earned many accolades and awards over the years, including most recently the Order of Canada. A plaque that will be displayed in the plaza was presented to Mr. Nasser by his son John Nasser, daughter Mona Nasser and Luke Schmidt of TD Greystone. River Landing is the most significant mixed-use project in Saskatchewan today, offering its occupants unsurpassed connectivity to all quadrants of the City and Saskatoon’s beautiful river valley. The 13 storey, 180,000 square foot East Tower is now 50% leased and will be completed in 2019. Construction of the 18 storey, 279,000 square foot Nutrien Tower is currently 60% leased with targeted completion in winter 2021. These distinctive towers will offer world class finishes, ample heated underground parking, contemporary employee amenities, fitness and conference facilities as well as outstanding restaurant and retail offerings.